I'm pleased to report that my new book is now shipping and is available at discount via Amazon. Here's an excerpt that introduces the notion of the performance niche. My review of expert performers in such fields as chess, military, athletics, and performing arts--as well as my research review of exemplary performers--suggests that success is not simply a function of qualities of the individual. Rather, it is the fit between the talents (inborn abilities), skills (acquired competencies), interests, and opportunities afforded by a field that creates accelerated development and eventual mastery. It means that success will not be found in better indicators, improved self-help techniques, or any of the endless parade of chart patterns, wave formations, numerology schemes, or moving average arrays. Rather, success is achieved when we find markets and styles of trading that take maximum advantage of our skills and talents. That keeps us focused on markets and absorbed in them, enabling us--over time--to internalize their patterns. If my book accomplishes nothing else, I hope that it assists you in thinking about where your niche might lie, not just in trading, but in life. The days pass by quickly; life is too short to waste on anything that you're not passionate about and good at. My thanks to the many readers and traders who contributed directly and indirectly to the ideas in the book. You have been a source of insight as well as inspiration. 11:24 AM CT - That TICK distribution has taken a negative turn, and we're testing yesterday lows in ES. Note that we are not making lows in the other major indices. It would take a drying up of selling to have me testing the upside here, however. The weak dollar and falling rates are not signs of economic robustness and macro traders obviously did not step up to the plate and buy this AM after the numbers came out. While I keep the longer-term research in mind, it will take a pronounced upward shift in TICK and participation lifting offers by large traders to have me buying again today. It's not an exciting way to trade, but over the years it's preserved capital for me. Thanks for the interest; I'll do another morning session later in November. 10:53 AM CT - Well, that's where stops come in handy. It's disappointing to scratch a couple of promising trades, but I don't know of any way to pursue the large gains without risking some of those profits in hand. But when we saw fresh selling drive the Russells and TICK down, that was the cue that we could not sustain the uptrend. Tonight I'll review my decision making and probably kick myself for not more proactively recognizing that we were in a rangebound market oscillating around that average price. That would have allowed for taking of profits as we traded above 1383 and stalled out. I've been trading since the late 1970s and continue to learn, continue to make mistakes, continue to search and re-search patterns. My longer term picture remains intact, but we'll need more participation to the upside to make that happen. Volume really tailed off as the morning wore on, and we could see some rangebound and slow trade ahead of economic numbers later in the week. Have a great one. 10:36 AM CT - Trade has slowed down and we're seeing those runs up and down initiated by the locals. I will not add to positions in that environment, but so far I'll need more concerted selling to take me out of the positions. The TICK distribution for today continues to look favorable relative to the last two days and note that, so far, we've held above yesterday's lows. Still, the 1383.25 average price is acting as a magnet on prices and we'll need volume to vault us to new value areas. I hope today's session has shown you a bit about money management, framing trade ideas, framing when to stay in trades vs. pull out, and how to coordinate a longer-term perspective with a shorter one. Arguably, I've gotten too caught up in the big picture today and missed some short-term trades. My hope is that you can learn from my mistakes as well as my wins. Have a great rest of the day. 10:25 AM CT - I have not added to positions on this pullback, as stocks in the basket have been weak and NQ is looking heavy. I could get stopped out at breakeven here, and that would just put me back in the mode of assessing the market, developing new ideas, etc. Back in a few. 10:05 AM CT - Stocks in the basket still look OK; a few making 5 min lows here. As long as those TICK pullbacks are shallow and occur at higher price levels, they are candidates to add to positions. But if we get aggressive selling (hitting of bids with size) and very negative TICK, that's a different matter altogether. I'll update at least once more before calling it a morning. 9:58 AM CT - Stops raised to breakeven. No sense letting good trades turn into losers. All part of the money mgt. I added the Russells because of the positive shift in the TICK distribution. Russells correlate about .78 with TICK. I keep all sorts of stats like that in my head to aid decision making. I might be a piggy here, but I think we have a shot to break the day's morning highs and get a flurry of buying as a result. So I'm holding on here and not taking profits. If I do take profits, I'll take off one unit at a time when TICK gets extended and if stocks in the basket aren't doing a good job making new highs. 9:50 AM CT - Added Russells to the position. Tight stop 772.2. 9:45 AM CT - Note the strength in energy issues. Why? Weak dollar: oil is dominated in dollars. Ditto gold. Not good, not good for the longer run, even though the big traders are lifting offers and the TICK has shifted dramatically upward. I've raised my stop to the day's lows (note that I'm giving this trade plenty of room to breathe, as it's designed to be held overnite) and will add to positions when selling bouts fail to take us to new lows. In a nice trending market (which this isn't so far!! ), retracements of the TICK back toward zero (or modestly negative) make good candidates for entries. I'll see how we hold up in price on the next such retracement before adding to the position, quite possibly with Russells. 9:40 AM CT - I'm not gonna lie. Having my initial position go under didn't bother me particularly. Seeing the dollar tanking and bond yields plummeting makes me really uneasy. That's traders anticipating recession, folks. We've gotten some nice buying, expansion of TICK, and stocks in the basket making fresh 5 min highs on a broad basis, returning the core position to breakeven. Now let's have sellers take their turn and see if we can hold at higher lows in TICK and price. That would get me adding to the position, but I still don't like that falling dollar. 9:28 AM CT - This is where money management is crucial. I took a small position with one unit of capital. I divide my trading capital into 4 units. If I'm wrong by buying (and my position *is* under water at this time), my losses won't be extreme. If the market is proving me right, I have plenty of opportunity to scale in. At present, it's not that we're seeing heavy selling so much as the absence of buying in the face of the weak economic numbers, rising bonds, etc. Declining issues only lead advancers by about 250 issues. But there's no way I'll add to the long position until the TICK distribution turns positive with readings over +800. 9:17 AM CT - I have a small core position long at this point and it's mainly playing for that edge over the next 5 days, as mentioned on the Weblog. As long as the TICK distribution stays more positive today than yesterday (and yesterday was stronger than Friday) and as long as we stay above yesterday's lows, I'll look for the Friday-Tuesday sequence as a transitional structure creating a market bottom. If we get fresh selling and extended negative TICK, I'll be stopped out. A few issues in the basket are perking up and showing new highs, but we need to see large traders lifting offers to confirm the long idea. 9:05 AM CT - Ok, we see signs of a bit of weakness, rates coming down, Euro strong against the dollar, some selling of stocks, but TICK holding up well. Basket of stocks making more 5 min lows than highs, large traders not hitting bids in force. I've been nibbling long as TICK went negative, but we need to stay above yesterday's lows to make this a longer term buy. 8:54 AM CT - Selling so far is modest in the TICK and volume continues strong. More than just locals in this market, and that usually leads to good movement. We're seeing some hitting of bids in Market Delta among large traders; that's kept me out of the long side. New 5 min lows in my basket have dominated new highs recently. The basket's weakness has kept me out of the long side as well. Patience, so far. Let's see how those numbers look and develop an idea from there. 8:41 AM CT - Remember that strong volume generally correlates with high volatility, so if our 5 minute volume readings stay high, I'd expect decent market movement this AM and today in general. I'm also tracking the net NYSE TICK, which has been positive so far; the volume at offer vs. bid in Market Delta (also positive so far); and the net new 5 min highs vs. lows in Trade Ideas (pretty even at this point). Note how the new highs/lows kept me from chasing the opening upmove. Staying out of bad trades is as important as making good ones. I'm flat and may well stay that way until the numbers come out; sellers taking their turn. 8:35 AM CT - Solid volume to open, particularly considering we're awaiting some numbers. We're seeing solid net lifting of offers among large traders, and that's showing up in a positive NYSE TICK and advancing stocks solidly leading decliners by over 600 issues. We've taken out yesterday's highs in NQ and Russell; so far the bullish bias is playing out. My basket of stocks is showing some issues making 5 min lows even as ES made its opening run, so I'm waiting for sellers to take their turn. 8:30 AM CT - Here's what I'm looking at on my screens: e-Signal tracks the NYSE TICK, TIKI, DAX, Russell, NASDAQ, and ES futures, along with sector ETFs. Trade-Ideas is tracking fresh five-minute highs and lows in my basket of stocks (see the Trader Performance page for details). Market Delta is tracking volume at the bid and offer and is alerting me to what large traders are doing. I also maintain a cumulative volume at price histogram on Market Delta that gives a rough reading of where our value area is at, a la Market Profile. That's it. The value area is approximately between 1381.75 and 1384.75. The big question for the open is whether we can get quick buying pressure to sustain us above that range, or whether we'll return toward the average price around 1383.25. 8:10 AM CT - Couple of quick announcements before the open. My new book, Enhancing Trader Performance, will be shipped in the next week. Initial comments from reviewers have been very positive; it's the first book I know of that tackles the issue of how traders can develop systematic programs of training for success. Also check out the Chicago Mercantile Exchange's free panel presentation on Peak Performance Electronic Trading this Thursday (11/2) at 2:30 PM CT, which I'll be part of. Registration is required; the session will be live at the Merc auditorium, but also Webcast for those unable to attend in person. I also want to offer a note of thanks to Brian Shannon, another trader devoted to the training of traders, for giving his blog readers a heads up on this morning's session. Brian's innovative use of video as a teaching tool, on his blog and in his online classes, is worth checking out. For other unique training tools, check out what Charles Kirk is quietly doing with the portion of his site devoted to members, in which he makes his trades, results, and trading journal available for readers. Also take note of what Howard Lindzon, Trader Mike, and others have put together in the video world with Wallstrip. Back after the open. 7:45 AM CT - The ECI report came in pretty much in line, and we're not seeing any radical moves in bonds, stocks, or the dollar as a result. Monday's average trading price was 1383 in the Dec. S&P emini futures, and we're trading above that level. Note that the Russell futures are closer to yesterday's highs than either the ES or NQ. With ES, we're looking at Monday highs of 1387 and lows of 1378.75. Given the bull bias of my research, my initial trading plan is to buy bouts of selling that hold above the Monday lows in anticipation of taking out Monday highs. A great setup would be to see early selling scare off bulls but hold above yesterday's lows, completing one of those transitional market structures spanning Friday through today. If that occurred, I would probably leave a piece on for a potential several-day move that would test the recent bull highs. My plan B kicks in if we get fresh selling pressure, perhaps as a result of those 9 AM CT economic reports. Fresh selling that breaks yesterday's lows with broad participation would target the cluster of daily lows we've seen in the 1369-1369.75 region and would flip me to the sell side. The important point here is that you rely on research for a leaning, but you don't get so wedded to that opinion that you ignore how the market is *actually* trading. I will start the morning flat. Back before the open. 7:00 AM CT - In my haste, I forgot to mention the Employment Cost Index report at 7:30 AM CT, which tracks the cost of labor. A very strong figure would be taken as inflationary and would likely lead to a jump in interest rates and pressure on the Fed to tighten monetary conditions. With economic reports before the open, I like to note the high-low range of the overnight market prior to the report and then the high-low range after the report until the open. That is a quick gauge of whether the report has fundamentally altered market participants' estimates of value. If the news is truly news, we should see a considerable adjustment in the bonds and currencies. 6:50 AM CT - Good morning and welcome to the Halloween AM session, in which we'll track markets and take a look at decision support for traders. Here are three reading assignments prior to the market open: 1) Take a look at my latest Trader Performance page entry in which I explain how I track intraday new highs and new lows with my basket of 17 stocks. I'll be referring to this during our AM session; 2) Note the research reported on the Trading Psychology Weblog. This is one reason I have moderately bullish expectations over the next several trading sessions; and 3) Check out the excellent Briefing website and click on their economic calendar, and then click on the economic reports due out today. At 9 AM CT, we'll have consumer confidence and Chicago PMI. The markets will be looking for signs of economic strength to see if we might get future rate hikes and interest rate firmness. Keep an eye on bond yields and the dollar when those numbers come out. If we get major moves in those markets, the odds are greatly enhanced that we'll see a trending move in equities, as markets price in fundamental, new information. All things being equal, we've been seeing sustained strength across a broad range of sectors and that normally leads to upside follow through in the near-to-intermediate term. But this is Halloween, and we could get some tricks along with promised treats. Back before the open. I recently encountered a market analysis that drew a parallel between the March-May runup in stock prices and the recent August-October rise. The implication was that we were due for a significant correction, as we had beginning in May. This kind of anecdotal reasoning which, in essence, says, "This market looks like this, so it should do that" has little place in the playbooks of serious traders. Because a chart or oscillator has a particular shape doesn't necessarily reflect supply and demand in the marketplace. This is why such superficial measures of the market fare so poorly when they are put to the test. Indeed, of over 6000 common patterns in the S&P 500 market analyzed by David Aronson in his excellent text "Evidence-Based Technical Analysis", none led to statistically significant profits. One reason that the August-October runup is different from its predecessor is that far more stocks have participated throughout the move. Above we see a chart of the number of stocks making new 65-day highs minus new 65-day lows (blue line) vs. the S&P 500 (SPY; red line). As the market moved higher from March-May, the net number of stocks making new highs was dwindling. As the market has moved higher from August-October, we've seen expanding net new highs. Since 2004, we've only had 24 occasions in which we've had 1250 or more new 65-day highs on a given day. This most recently occurred on Thursday, when we had 1450 new highs across the major stock exchanges. Twenty days after such occasions, SPY has been up by an average of 1.01% (21 up, 3 down), much stronger than the average 20-day gain of .56% (433 up, 260 down) for the entire sample. Anecdotal reasoning may tell us that we're due for a significant correction, but my previous research, as well as these findings, just don't bear that out. How we make new highs is crucial to whether or not those new highs are sustained and extended. Another way of saying this is that the trajectory of a market move matters as much as the trend. There are plenty of market gurus who offer trading advice based on anecdotal reasoning. Their promises and claims of success are equally anecdotal. Trading with a knowledge of market history is hardly infallible, but it beats the alternative: trading in ignorance of history. Later this AM, we'll commence the Morning With the Doc and track the market in real time. Also, please be my guest at the free panel discussion I'll be participating in on Thursday, November 2nd at the Chicago Mercantile Exchange. It will also be Webcast; should be fun. Thanks for all your interest in the blog, as well as your insightful comments. Traders don't need education. What traders most need is training. Look at all the websites, blogs, and books devoted to trading. If success were a function of education, surely we'd see a helluva lot more profitable traders. No, giving a struggling trader blog columns and newsletter articles is like giving a starving man a menu. That's not to say that education is unimportant. Look at successful training programs--in medicine, music academies, the military, sports--and you'll see evidence of hands-on teaching. But no one pretends that you will make a surgeon, violinist, fighter pilot, or quarterback by conducting seminars and providing written material. Training builds upon education by providing structured opportunities to learn by doing. The psychotherapist in training sees role-played clients--and then real ones--while being observed by a mentor/supervisor. The surgeon trains with a senior physician: see one, do one, teach one is the motto. A violinist is assigned pieces by a teacher and executes these many times in practice and in lessons before performing at recital. New fighter pilots spend many hours in simulated aircraft and then in the cockpit with an experienced pilot before being given their own jet. The quarterback not only sees plays diagrammed, but runs these time and time again in practice under the watchful eye of the coach prior to using those plays in a game. Trading, like those other fields, is a performance skill--not merely a body of knowledge. Education informs; training develops skill. If skill were a matter of explicit knowledge and learning, the most informed athlete or trader would also be the best one; we could give IQ tests and predict performance. In the near future, building upon the release of my book on trading performance, I will be incorporating more training features into this blog and and into my personal site. The morning sessions with the Doc (the next scheduled for tomorrow) are but the first step. Intensive daily review of trading patterns/setups to train your eye for opportunity are another step. Ultimately, however, what traders most need is to be observed--in real time--as they trade, with immediate feedback and instruction. That's the training doctors, athletes, and pilots get. How to provide such training economically is a thorny logistical problem I'm working on. It's a lot easier to write articles and offer seminars and pretend that those, by themselves, will enhance trader performance. But the success rate among new traders bears eloquent witness to the limitations of such a strategy. We can think of the short-term psychology of equity index markets as standing on four legs: price, volume, sentiment, and participation. I will be discussing these in real time during Tuesday's Halloween Morning With the Doc. The distribution of volume at various prices, captured by the Market Profile, tells us whether demand or supply are expanding as we move further away from value. This helps us handicap the odds of breakout vs. retracement as we near the edges of ranges. Sentiment, on the short-term basis, is captured two ways: by tracking the volume at the bid vs. offer, especially among large traders; and by following the number of stocks trading at the bid vs. offer, reflected by the NYSE TICK. Participation is a measurement of the number of stocks participating in a general market move. As I recently posted, gauging the number of stocks making new highs vs. new lows on a market move provides useful information about whether that move is likely to continue or reverse. These four variables are worth tracking across multiple time frames. Together, they provide a reading of the market's psychology. Above, I've taken the new highs/new lows from my basket of stocks, but now am applying the data to 5 minute closing values rather than daily data. 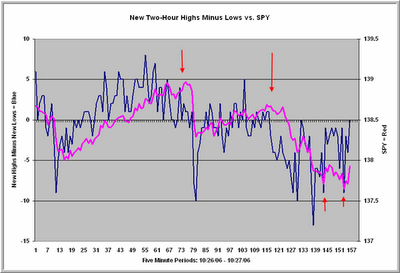 We're looking at the number of stocks making two-hour highs minus those making two-hour lows over a two day period. Observe the divergences marked by the arrows. It is very common that, when the S&P 500 Index (SPY) makes new highs and we get an expansion in the number of issues making new highs, that upmove will continue. Conversely, when we see divergences such as those marked, we commonly encounter retracement of those upmoves. A more complete analysis, drawing on all four legs of market psychology, would show you that, as you were above value in the market near 139 in SPY, volume was decreasing, the proportion of volume at the market offer was decreasing, the average NYSE TICK was waning, and fewer stocks were participating in the average's new highs. Much of what constitutes skill in the markets is recognizing in real time when these four variables are acting in concert and making decisions accordingly. Ultimately, what all successful traders are doing is tracking shifts in supply and demand. The four legs of market psychology are simply tools to help traders conceptualize such shifts. Can There Be An Objective Basis For Subjective Knowledge? In my recent post, I cited Ayn Rand's assertion that philosophy is the most practical of disciplines. This is particularly true with respect to epistemology, that branch of philosophy that deals with knowledge and its acquisition. What we count as truth ultimately determines how we pursue truth, whether in markets, science, or politics. Ms. Rand also stressed that contradictions cannot exist in reality. Where we find a contradiction, she advised, check your premises. At least one of them will be incorrect. The positivism expressed by David Aronson's fine book Evidence-Base Technical Analysis yields just such a contradiction. Before I launch into the contradiction and a possible resolution, allow me to mention (on an unsolicited basis!) that Aronson's book is a substantial contribution to the literature on technical analysis. One need not agree with his strident formulation that the discretionary application of technical analysis does not draw upon "a legitimate body of knowledge but a collection of folklore resting on a flimsy foundation of anecdote and intuition" (p. 261) to benefit from the reading of his work. 4) He reviews major theories and research findings in behavioral finance to help traders begin the process of finding more promising patterns. For a book that deals with technical themes of logic and mathematics, his work is eminently readable and understandable. I would rate it alongside Kenneth Grant's "Trading Risk" as a must read for developing traders. That having been said, I believe Aronson's positivist roots--leading him to equate knowledge with declarative statements known to be true--create a Randian contradiction. If all knowledge consists of verifiable statements about observables, then Wittgenstein is correct in his formulation: Whereof we cannot speak, thereof we must be silent. Subjective knowledge must be an oxymoron. But here is the contradiction: It is common--certainly in my visits to proprietary trading firms, hedge funds, and investment banks--to find discretionary traders who have achieved a high level of trading success year after year, trading actively. Indeed, I wrote about just such an individual in my new book on trader performance. These are not mere anonymous figures on bulletin boards puffing up their performance stats. These are traders who have account statements and risk managers able to verify their superior performance. And yet they cannot verbalize specific rules or systems for their trading. In short, they have knowledge, but it is not of the verbal, declarative kind. The existence of such implicit learning has been known in cognitive neuroscience circles for decades. Philosopher Michael Polanyi offered an influential treatise on tacit forms of knowledge, and Arthur Reber began his groundbreaking studies in the 1960s, culminating in his 1993 text "Implicit Learning and Tacit Knowledge". More recently, Timothy Curran, in the "Handbook of Implicit Learning" summarized research that found different brain mechanisms mediating implicit learning and explicit, verbal knowing. How does implicit learning occur? Through intensive repetition, in which individuals become sensitive to complex and noisy patterns. This is how young children learn to speak grammatical English before they can verbalize the rules of English grammar. It's also how we can identify a face that we could never adequately describe in words, and it's how we know when such a face is starting to display anger or sadness. Serial reaction time experiments show that subjects can learn complex statistical probabilities in sequences of data with enough repetition and feedback. Interestingly, they can anticipate events in those sequences, but cannot verbalize the complex patterns that they have internalized. (The research of Axel Cleeremans is particularly eloquent on this point). Such subjective knowledge is not "devoid of information" as positivist philosophy would have it. There are, of course, intutions that prove to be invalid, but reducing all knowledge to testable hypotheses would probably eliminate most of the knowledge and understanding that lies behind great art, as well as most performance fields such as athletics. The deep knowing of musicians, chess players, and fighter pilots can hardly be reduced to sets of explicit propositions. If we admit the possibility of such subjective knowledge, then it follows that the development of algorithmic systems with fully backtested rules is not the only way to achieve trading success. It may be possible to generate success by accelerating processes of implicit learning through the use of simulation/replay and intensive feedback. Ironically, the weakness of much technical analysis is not that it is subjective, but that it pretends to an objectivity that it cannot support. Can there ever be an objective basis for subjective knowledge? I believe so. A trader's track record of profit/loss can be compared to random entries/exits (as well as buy and hold) to objectively determine whether or not that trader--over time--exhibits significant skill. Imagine a Monte Carlo simulation in which we create random entries and exits each day that a trader trades, with identical trading frequency and holding times. Suppose that such a simulation is conducted 10,000 times by computer. The resulting distribution of P/L would display the likelihood of achieving a given level of profitability by chance alone. If a trader's subjective trading methods consistently produce results at the very upper tail of that distribution, we can objectively infer that the subjective trader is skilled. In other words, by treating each trader as a trading system, we can evaluate that trader's level of knowledge, regardless of whether the knowledge is subjective or objective. In the absence of such score-keeping, discretionary traders have no basis for a belief that they possess a true edge in the marketplace. One need not resort to positivism--or system-based trading--to be rigorously scientific. It is precisely because intuitions are fallible and human senses are so easily deceived that we need to distinguish truly superior outcomes from merely random ones. When Markets Don't Correct, Are We Due For A Correction? The most recent post on evidence-based trading emphasized the importance of our knowing what we know. This was illustrated for me quite recently when I read that we were due for a meaningful correction because we hadn't had one for a while. Let's see if that reasoning is valid. It turns out that we haven't seen a daily 1% or greater decline in the cash S&P 500 Index ($SPX) in over 60 trading sessions. Since 1990 (N = 4183 trading days), this has only occurred on 177 occasions. When we look at what happens 60 trading days later, it turns out that the S&P 500 Index is up by an average of 4.61% (153 up, 24 down), quite a bullish edge compared to the average 60-day change of 2.21% (2845 up, 1338 down). Over essentially every time frame leading up to 60 days, moreover, we see above average returns following from periods in which we haven't had a 1% daily correction. In short, the absence of a drop does not make a fall more likely. Indeed, it has led to superior returns over the intermediate term. Why is this? The majority of periods when we haven't had a large drop are periods in which we haven't had large moves of *any* kind. These have been low volatility periods in the market, from 1993-1995. Recall from the recent post that low volatility periods have actually shown superior returns over the intermediate term. Are we overdue for a drop? Yes. We don't typically have runs of no 1% declines for months at a time. Does that mean the market is headed lower? Not at all. Only six of the 177 periods in which we have not had a 1% drop led to a decline of 2% or more in the following 60 trading sessions. It helps to know what we know: that's the appeal of an evidence-based approach. Tomorrow we'll explore the limitations of the approach. The late Ayn Rand emphasized that philosophy was the most practical of disciplines: it governs the ideas that lie behind all we do and think. The philosophical premises we assume affect how we approach trading. A beautiful example of this is David Aronson's new book, "Evidence-Based Technical Analysis". It's a well-written, thought-provoking text, with many practical examples of how to conduct data analysis in an objective way. This is bound to rub many traders the wrong way, but it's an important challenge. What is knowledge? How do we know what we know in the markets? How can we demonstrate that knowledge is such, and not illusion? Once we start with the premise that all knowledge consists of explicit propositions that can be tested for truth, we necessarily are led toward trading that is rule-based and rigorously backtested. Is there another, *valid* form of knowledge and trading? Can we prove that? I'll be interested in readers' comments before I offer my own alternative in my next post. For years, behavioral finance researchers have been aware that people's decision making is greatly affected by how choices are framed. For instance, the same monetary bet framed as a choice between a certain vs. risky gain and a certain vs. risky loss elicits very different choices. (We tend to take certain gains, but will seek risky losses to avoid certain loss). Studies using functional magnetic resonance imaging (fMRI) find that we expend less cognitive effort in taking a sure gain than in choosing risky gains, sure losses, or risky losses. It may well be that traders don't let their profits run simply because they take the easy way out cognitively. Conversely, traders may be reluctant to set and follow stops because of the greater cognitive effort required. It turns out, however, that this taking the easy way out and avoiding difficult decisions may not be a function of laziness. A very interesting investigation coming out of the Institute of Neurology at University College London finds that the framing effect on decision making is mediated by an emotional center within the brain: the amygdala. This is the same brain center that cognitive neuroscientist Joseph LeDoux has linked to our response to stress and trauma. The implications are significant. When blood flow is directed away from the brain's executive center, the frontal cortex, and the amygdala and associated emotional centers are activated, we are likely to underutilize those executive functions--reasoning, judgment, planning--and respond to our (emotional) framing of choices with a lack of effort. Going with our feelings might just be the reason we don't think through our choices. It is also likely that we frame our choices differently during periods of focus/concentration vs. emotional arousal. Stressful episodes in the market, activating the amygdala, are likely to elicit a framing that is different from the careful trade planning we conduct when we are cool and calm. Research, for instance, finds that fear and anger color our decision making about preparing for terrorism-related risks. Emotional factors have also been found to color decision making about economic choices. This helps to explain why I have found biofeedback to be extraordinarily helpful for traders who experience emotional disruptions of decision making. By working with traders in stressful situations and having them control their level of arousal during these episodes, biofeedback enables them to retain access to their executive capabilities. In a very important sense, successful traders train their brains for accurate decision-making under stressful circumstances. Sometimes, looking back on our trading decisions, we wonder if we were in our right minds. How accurate that concern turns out to be! Some of the best trading psychology interventions are the ones that keep us in our right minds as we make decisions under conditions of risk and uncertainty. If you have an interest in trading psychology, be sure to check out the free panel presentation next Thursday, November 2nd. The session will be held in the auditorium at the Chicago Mercantile Exchange and will start at 2:30 PM Central Time. I'll be on the panel, along with two excellent colleagues: Doug Hirschhorn, Ph.D. and Denise Shull, M.A. Both of them actively work with traders as coaches and do a fine job. The event will also be Webcast for traders outside Chicago. There will be presentations by each panelist, followed by discussion. James Oliff, Vice Chairman of the CME Board of Directors, will be the session moderator. It's a session I'm looking forward to; be sure to introduce yourself if you attend live. My special thanks to Curt Zuckert at the Chicago Mercantile Exchange Education Department for his role in organizing this event. If you haven't checked out the amazing educational resources at the Merc--including the library for traders, the Globex Learning Center, and the many courses and seminars they offer--please do so. Their staff and offerings are first rate. My recent Trading Markets article noted that we have seen historically low volatility in the present market. Indeed, going back to 1964 (N = 10,713 trading days) in the S&P 500 Index ($SPX), we have only had 1415 days similar to the current period, in which the average daily trading range has been below 1% on a 40, 200, and 500 day basis. In today's post, I will elaborate on some of my historical findings, which have quite a bit of relevance for the current equity markets. First off, volatility has been tailing off in recent years. All of the sub-1% average trading ranges over those three time frames have occurred since 1985; none occurred before then. I think this is tremendously significant. With the advent of stock index trading has grown a trade in arbitrage and program trading. This has created greater periods of reduced volatility in the S&P 500 Index. As we see a growing number of ETFs, those opportunities for arbitrage expand to an ever-greater proportion of equities. I would not at all be surprised if we see greater periods of low volatility among NASDAQ, small cap, and mid cap stocks as a result--not to mention sectors such as emerging market issues and international indices. Second, the notion that range-bound, non-volatile markets are "due" for a breakout just doesn't hold water. The occasions of low volatility have persisted for years (late 1984-early 1986; 1992-1996; 2005-present). Indeed, sixty days after a low volatility period, the average daily trading range is .83%--much lower than the average range of 1.45% for the sample overall. Volatility--and its absence--displays a serial correlation: non-volatile periods tend to be followed by non-volatile periods, not dramatic breakouts. Third, while low volatility periods have tended to follow market rises, that doesn't mean that low volatility periods are associated with future stock price underperformance. Indeed, 60 days following the low volatility periods in the sample, the S&P 500 Index averaged a gain of 3.37% (1091 up, 324 down)--much stronger than the average 60-day gain of 1.86% (6779 up, 3934 down) for the entire sample. Indeed, buying 5% corrections during low volatility periods has led to very handsome returns. Fourth, no bear market--including those of 1987, 1990, 1998, and 2000--has begun during a period of ultra-low volatility. Invariably, following such low volatility periods, prices have moved higher with expanded volatility before a bear market has taken hold. The historical record suggests that low volatility periods persist until macroeconomic events lead to major reallocations of capital, contributing to both volatility and directional price movement. One of those macro events in recent history has been rising interest rates. It is difficult to imagine what would cause volatility to enter the current market in the absence of either radical geopolitical uncertainties or tectonic shifts in rates and/or currencies and commodities. Finally, a note about high volatility. When the average daily range has been elevated on a 40, 200, and 500 day basis, we have a veritable who's who of excellent buying occasions. These include 1974, 1982, 1970, and 2002. Low volatility does not guarantee a bear market, but high volatility has been associated with the end of many major bear markets. Tracking the ebb and flow of volatility and price change through multiple cycles reveals very interesting relationships that connect nicely with a broader understanding of the business cycle--and the role of institutions in allocating funds to equities relative to competing investments. Low volatility occurs when institutions find no compelling reasons to make radical shifts in reallocations. Back by popular demand, a week from tomorrow (Tuesday, October 31st), in time for the scariest night of the year, let's do another Morning With the Doc. The transcript from the last session will give you a good idea of the kind of things I'll track in real time. 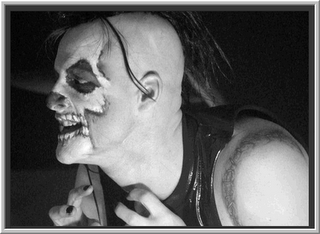 Plus I might even make a frightening trade or two. Hope to see you there. It won't be as good a scream as George Romero's video for Michale and crew, but I hope to make it entertaining nonetheless. My most recent post to the Trading Psychology Weblog observed that the weekly high-low range following a week that ends with a low VIX is about 1/3 narrower on average than the normal weekly range. In honor of last week's closing VIX of under 11, let's drill down and see if low option volatility at the end of one day is associated with low stock volatility the next day. I went back to 2004 (N = 706 trading days) and found that the average daily high-low range for the S&P 500 Index (SPY) was .94%. When the daily closing VIX was above 16 (N = 125), the average daily range was 1.17%. When the VIX was below 12 (N = 169), the average closing range was only .77%. That tells us that average next day price volatility is about 30% lower following a relatively low VIX day than a relatively high day. To put this into practical perspective, consider that, when the VIX closed below 11 (N = 28), only 4 of the next 28 days had a range exceeding 1%. When VIX closed at or above 18, however, (N = 40), 29 of the next 40 days had a range exceeding 1%. High-low volatility is an important component of opportunity for the day trader. By knowing how much movement is likely in a day, we can gauge how much we're likely to take out of trades lasting a given duration. Recall also that volatility is very closely correlated with volume and the presence of large traders in the marketplace. The relationship between VIX and equity price volatility is telling you something very important about the dynamics of participation among large traders. When relatively little premium is priced into options, no one is expecting dramatic movement--and in the short run, their expectations are self-fulfilling prophecies. 1) Keep Your Money Before You Trade - Lots of gurus will make promises, lots of vendors hawk products and services, lots of conferences promise education at a hefty fee. The reality is that the Web is filled with valuable, free or low cost information in blogs, Websites, user groups, portals, and books. You can learn more from networking with real traders through sites like Woodie's CCI Club and Stock Tickr than from buying expensive products and services that may or may not fit your trading goals and style. Keep your initial overhead low; every penny you save is future trading capital. 2) Crawl, Walk, Run - Do everything you can to survive your learning curve and to ensure that you can support yourself financially (and emotionally) through your learning curve. Trade in simulation mode before you put money at risk, trade one lots before you trade larger size. Make your mistakes when your exposure is lowest. If you can break even after trading costs/expenses, you're doing very well. Don't push the curve or you'll find yourself deep in a hole. 3) It Takes Money to Make Money - Keep your expectations realistic. You're not going to make triple-digit returns every year and support yourself on a five-figure portfolio. Trying to make consistent huge returns will lead you to take excessive risk. Eventually you'll hit a string of losers and you'll be down 75% on your money--which means that it will take a quadrupling just to bring you back to where you were. Focus on realistic, consistent returns; pursue a career, not a jackpot. 4) Learn Everything You Can About Risk - Before you trade, make sure you understand the relationship between holding times and risk/reward, the ways in which diversification lowers risk, and the role of position sizing in risk. Monitor your largest winning and losing trades and monitor your average holding times for winning and losing trades. Learn to take planned losses and learn to bet fixed (reasonable) percentages of your portfolio on each trade. Think like a portfolio manager: keep score, not just in dollars and cents, but in risk-adjusted returns. 5) Test Before You Trade - Don't put your hard-earned money--not to mention your time and effort--on the line until you've tested out the strategies that you're trading. That means you need to have strategies, and you have to track their performance. That can be accomplished historically, through real-time simulated trading, or both. Take nothing for granted; if gurus champion particular setups and don't offer objective performance data for their techniques, ask yourself why. If you don't have a demonstrable edge that you have verified, you won't have confidence in your methods when you need it. You also won't overcome the inevitable expenses of trading. 6) Keep Your Money After You Trade - Trading income is not like an annuity; there are always peaks and valleys in returns and plenty of flat periods. Markets change, and their patterns change. Few traders make as much in range bound markets and non-volatile markets as in trending, volatile ones. Save income from the good times to weather the down times. Give yourself enough cushion to relearn patterns and change markets if conditions dictate. In short, approach trading like you're starting a business. If you were opening a restaurant, you'd keep overhead down, build your business from the ground up and learn from experience, make sure you're well capitalized, stick with what you do best and avoid large gambles, perform plenty of consumer/customer/marketing research, and keep a portion of profits for weathering slow seasonal periods. It takes a year or more for even successful restaurants to build a clientele and earn a favorable return. Your trading business will require similar patience and dedicated effort. My last post examined relative new 20-day highs and found an interesting momentum-based pattern in the data from 2004 to the present. In this post, we will look at relative 20-day new lows and see if there might be similar tradable patterns. As before, relative new lows reflect the number of stocks making fresh 20-day lows minus the average number of new 20-day lows over the prior 20 sessions. When the relative new lows are highly positive, it means that many more issues are making new lows than over the previous 20 sessions. A highly negative reading indicates that new lows have contracted greatly from their recent average. Since 2004 (N = 697 trading days), we have had 52 occasions in which new 20-day lows have exceeded their 20-day average by 750 or more. Five days later, the S&P 500 Index (SPY) was up by an average of .52% (35 up, 17 down). That is much stronger than the average five-day gain of .14% (391 up, 306 down) for the entire sample. In other words, when new lows have expanded sharply, returns have been bullish over the subsequent five trading sessions. When new lows swell, it’s not been time to sell. How about when the number of new lows contracts greatly? Since 2004, we’ve had 60 occasions in which new lows have fallen short of their average by 600 issues or more. Five days later, SPY is up on average by .19% (36 up, 24 down), modestly stronger than the average five-day performance. Interestingly, however, when we look 9 days out, SPY was up on average by .54% (43 up, 17 down). That is much stronger than the average 9-day change of .26% (408 up, 289 down) for the sample overall. In short, it has paid to buy and hold after new lows contract sharply. These results point to two bullish edges: 1) a reversal effect after new lows expand greatly; and 2) a continuation effect after new lows sharply contract. When new lows have neither expanded nor contracted significantly (i.e., have been within 200 issues of their 20-day moving averages; N = 291), returns in SPY have been subnormal from 5-9 days out. Once again, this points to strong momentum and lack of momentum as important variables in short-term market returns. The 20-day new high/new low data each day are available from the Trading Psychology Weblog. And when new highs go into the cellar, should you be a seller? In a recent post, I took a look at what I called the relative new high ratio and found an interesting pattern of price changes following extremes in the proportion of stocks making new highs relative to their moving average. The Trading Psychology Weblog tracks fresh 20-day new highs and new lows across the major exchanges. Might we learn something about momentum and short-term trading patterns from relative 20 day new highs? For this investigation, I simply took the number of new 20-day highs and lows and subtracted from them the 20-day moving average of 20-day new highs and lows. This gives us a reading of when those new highs and lows are expanding and contracting relative to the past 20 trading sessions. 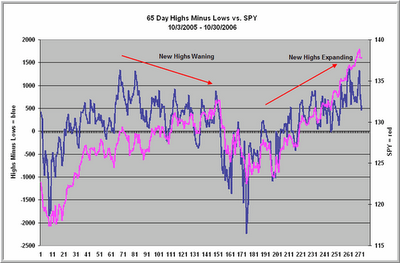 The data go back to the beginning of 2004 (N = 697 trading days). Interestingly, when there is a strong expansion of new highs, with the number of relative new highs exceeding +750 (N = 43), the next five days in the S&P 500 Index (SPY) average a gain of .13% (25 up, 18 down). This is virtually the same as the average five-day gain for the entire sample (.14%; 387 up, 310 down). In other words, when new highs expand sharply, there is no bearish edge whatsoever. Stocks continue rising at their normal rate. When the number of new highs expand, but less vigorously (N = 270), the next five days in SPY average no gain at all (144 up, 126 down)--a subnormal return from average. This finding fits with my other research suggesting that rises on strong momentum tend to persist, whereas rises on modest momentum yield no bullish edge. Now let's take a look at sharp contractions in the number of new 20-day highs. When these have exceeded -600 (i.e., when the number of current new highs falls short of the moving average of new highs by 600 or more; N = 44), the next five days in SPY have averaged a gain of .59% (32 up, 12 down). That is considerably stronger than the average five-day performance since 2004. In other words, when stocks retreat en masse from their new highs, that's been a good time to buy. This also fits with recent research that finds that great times to buy are when few stocks are attracting favor. Quite a bit of evidence, across different time frames, converges to suggest that it is the trajectory of a market rise--its momentum--that accounts for whether that rise is likely to persist in the near term or not. 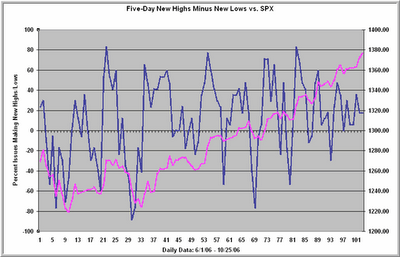 On Monday, we saw a solid expansion of relative new 20-day highs. As long as that expansion persists, we can't legitimately conclude that this is an overbought market with a high probability of decline. So to summarize: When new highs get much higher, it's OK to be a buyer. But when new highs go into the cellar, you don't want to be a seller. My next post will take a similar look at the new low data and see if any patterns emerge from the expansion and contraction of new lows. These are the three legs of the performance stool: (1) your talents and interests, (2) your trading style, and (3) markets and their personalities. The meshing of your qualities with your trading style will help determine your ability to trade that style with consistency and discipline. The meshing of your trading style and the features of markets will determine the degree to which you have a performance edge in the marketplace. The ever-shifting features of markets ensure that traders who are adaptable will be most likely to sustain expert performance over the course of a trading career. I recently received several emails from readers asking questions about that perennial problem: maintaining proper trading discipline. Sometimes the problem is holding losing trades too long or violating stop loss levels. Other times, it's breaking rules regarding position sizing or when to trade (and not trade). On yet other occasions, the problem is failing to take trades that set up or jumping into trades before they fully set up. Always, however, the problem is a failure to fully follow plans and intentions. As the quote above suggests, my new book--due out at the end of the month--tackles the discipline issue from a different angle. Discipline problems, I maintain, are not the cause of trading woes. They are symptoms of other difficulties. Just as a problem maintaining the "discipline" of monogamy in a marriage is frequently the result of underlying relationship difficulties, failing to be faithful to one's trading plans is often a sign of conflict between the trader and those trading plans. 1) Neuroticism - Our tendency to experience negative emotion. When people show a tendency toward anxiety, depression, and anger, the volatility of the market--and the volatility of trading results--frequently sets off emotional volatility, interfering with sound decision-making. 2) Extroversion - Our tendency to be outgoing and oriented toward the outer, rather than inner, world. When people have many extroverted features, they tend to be risk takers; when extroversion is low, they tend to be more risk-averse. 3) Openness to Experience - Our desire for novelty and stimulation. When traders have a high degree of openness, they lean toward more discretionary, unstructured trading methods; when the openness is low, they prefer highly structured, rule-governed methods. What happens when the plans we select for our trading don't truly mesh with our basic personalities? The result is that we continually find ourselves veering away from those plans. A trader high in neuroticism will have difficulty following a trading system that puts a large percentage of capital at risk, that trades volatile markets, or that requires large drawdowns. A trader high in both extraversion and openness will have difficulty following a patient trend-following system. Frequency of trading? Placement of stops? Times of day to trade? Number of instruments to follow and trade simultaneously? All are impacted by our personality traits. When traders who are normally disciplined find themselves breaking their trading rules, the lapses of discipline are a symptom of a lack of fit between who the traders are and what their rules demand. A fine system on paper is unprofitable if it cannot be followed by a trader. A trading method not only needs to be good; it needs to be good for the trader. The answer is not to blame yourself for lapses of discipline or exhort yourself with motivational nonsense. Rather, keep a journal and truly investigate each of your lapses. Then view those lapses as information, not as problems. What do they say about you? Which rules do you find yourself breaking, and what inside you might conflict with those rules? Now look at your trading successes. What came naturally to you? What rules and plans can be derived from those winning trades? Don't force yourself into a pre-made set of trading plans: identify what you do when you win and see how you can make *that* into your system. Maybe, just maybe, breaking your rules is the first step in figuring out who you really are. A variety of trading psychology articles on my personal site might further that process. In the Trading Psychology Weblog, I keep a running tally of the number of stocks making fresh 20-day new highs and 20-day new lows. Having kept those figures for about three years now, I've seen that there is a momentum component embedded in that measure. When we get a large expansion of new highs, very often the upside momentum continues over a short-to-intermediate time frame. In a recent post, I went back to 1990 and found that, when we measure new highs as a percentage of total issues traded, returns are superior when very few stocks are making new 52-week highs compared to when many issues are at annual peaks. In this investigation, I create a new measure that we can call the relative new high ratio. I compute the percentage of issues traded that are making new highs and express this as a ratio. The denominator in the ratio is the average proportion of stocks making new highs for the 20 prior trading sessions. Thus, if we have a relative new highs reading of 2.0, it means that the proportion of stocks making new highs is twice as high as it has been over the prior 20 days. Conversely, a ratio of .50 means that we're seeing only half the proportion of issues making new highs as we've seen over the last 20 sessions. Since 1990 (N = 4196 trading days), we've had 90 occasions in which the relative new high ratio has hit or exceeded 2.5. Forty trading days later, the S&P 500 Index ($SPX) has been up by an average of 3.32% (70 up, 20 down), much stronger than the average 40-day gain of 1.47% (2695 up, 1501 down). This signal only occurs, on average, a few times a year, but a win percentage of over 75% is notable. The last signal occurred on August 4th of this year, which turned out to be a great time to buy. Interestingly, when the relative new high ratio is very low, we also get some good buy signals. Specifically, when the ratio has been .25 or under (N = 160), the next 40 days in the S&P 500 Index have been up by an average of 2.83% (120 up, 40 down)--again much stronger than the average 40-day performance, with a solid win percentage. The last time we had a signal from a low relative new high ratio was June 14th of this year--also an excellent time to buy for the interemediate-term hold. The relative new high ratio catches bursts and contractions of new highs: times when people are pouring into stocks or bailing out of them. In that sense, it may be capturing a piece of market psychology. Can we obtain similar findings from the new low data? That study will be coming up shortly. Just found out I'll be on CNBC's "On the Money" show around 6:00 PM Central Time, with host Dylan Ratigan. We'll be talking about investor psychology and Dow 12,000. Should be fun! 12:54 PM CT - Quick note for anyone still logged in. Semiconductors led the way down and now are not making new lows even as we've seen new lows in the major indices. Just something to keep an eye on. 10:12 AM CT - Well, it's time for the sound and light machine--a nice cognitive break in the virtual state. We're looking to test the lows; it wouldn't surprise me if we're putting in one of those "transitional structures" for a low. That usually takes some time, however, so I'm in no rush to sell lows or jump in and buy strength. If we see volume pick up as we approach lows and large players hitting bids, then we've got a different story indeed and that 1369 average price becomes the immediate target. Some days like today work out well and you get your piece; other days aren't so profitable. The main thing is to find an edge, stick with it even as the market seems to be going against it, and then take advantage when order flow starts lining up with the research. Thanks for joining me for a morning with the doc. Feel free to email with questions. I'll do this again if there's interest. Have a great morning. 9:57 AM CT - I'm out and now it'll take new setups to get me in. Wrap up in a few. 9:41 AM CT - Hopefully you can review all this after the close and see how the moves have evolved. Notice that, once the downmove is in place and the TICK distribution is shifting down, bounces in the TICK provide opportunities to add to short positions. It also allows you to do what I like to do, which is scalp around a core position: add to shorts on bounces, take profits on moves to negative TICK, and let a core position ride. Money mgt very important, but what made me money today is patience and confidence in the research. That's the takeaway lesson for the day, IMO. 9:30 AM CT - Watching for bounces at lower TICK peaks as potential opportunities to add to the short position. Stop moved to break even. Having a few more blogger issues; may affect frequency of posting. 9:20 AM CT - I'm playing with the idea that we've seen our highs for the day. Given current volume, I estimate the day's range should be above 1o ES points, so I'm thinking we could go lower here. I'm short a few Russells and will add Spooz on weakness. A break below the pre-announcement lows of ES 1372 would likely bring in added selling. 9:08 AM CT - We've rejected those highs around and what we're seeing is that when the buyers take their turn and drive TICK up, it sets up more selling. TICK has been eroding, but by no means is showing broad based selling. Rather, we're seeing continued elevated volume and large participants in the stock indices selling into rallies. These are not just locals--too much volume sustained for that. It leads me to believe that we've made a higher high as part of a broader topping process, not as a new bull leg. Following the discipline and not chasing the highs paid off. No sustained positions here; just scalp bounces in TICK mode. 8:55 AM CT - Notice how SMH has once again served as a leader and the heaviness in the Russell alerted us to waning strength. TICK remains above zero; let's see what the buyers can muster. Semis continue to lead the downside. TIKI has shown program selling as NQ and SMH have sold off. 8:50 AM CT - My TIKI data show very little or no program selling thus far this AM. Not a market to sell into for anything other than a little scalp. Conversely, given my research, the highly elevated TICK and advances/declines are not tempting me to chase highs. Patience isn't exciting, but it's kept me in the game since the late 1970s. Russells looking heavy; let's keep an eye on that too. If semis and Russells stop making new highs on buying spurts in TICK and ES volume lifting offers, that's when I might start nibbling on the short side. 8:42 AM CT - In Market Profile terms we're trading above value, so we want to see if this attracts business or attracts sellers for a return to the value area. So let's keep an eye on volume. Five min volumes are much above average, suggesting that, indeed, we are seeing new business and the bulk of this is buying interest: lifting offers in ES and high TICK. Note, however, that semiconductors are relatively weak, and they're often a leader. Let's keep an eye there and on NQ. Thanks to Brian Shannon, BTW, for mentioning the AM feature; his Alpha Trends website is one of the best purely educational trading sites out there. Advances lead declines by 1687 issues--very strong. Not a market I'd fade until I see more distinct weakness in TICK, volume in ES at bid, etc. 8:34 AM CT - Reminder: we have crude inventories reported later this AM. We open with positive TICK (sustained readings above +250 show distinct buying interest) and advancing stocks leading declines by 840 issues, as we make an effort to surmount the Monday highs. I don't short the market for sustained positions as long as the TICK distribution is positive. Market Delta shows net volume at offer rather than bid. Odds of sustaining new highs are good as long as this continues. 8:08 AM CT - We continue to see strength; the proportion of ES volume trading at the offer vs. the bid is solidly bullish thus far. We're now at those rally highs, so we'll see if they act as resistance. My strategy is to go with new highs only if momentum is quite good (persistent high NYSE TICK) and if the majority of sectors are participating in the rise. Otherwise, I think we could see selling into those highs. I remain flat. Blogger continues to give some problems this AM, so my updates after the open may be more infrequent than I would ideally like. Back after the open. 7:40 AM CT - Core CPI was in line, CPI a little weaker than expected, housing starts a little better than expected. Net, net? So far, gyrations, but no dramatic directional move in the dollar or interest rates. Dollar a bit firmer vs. Euro, rates a bit higher. What does that tell us? As long as the dollar and rates stay pretty much where they were yesterday, it means that the economic news has not given us any fundamental reason to change our estimates of value. The ES and Russell futures jumped on the news above their afternoon highs, but have settled back somewhat; NQ is weaker and did not advance above the afternoon high. In ES, 1372 represents the low prior to the release; 1371.25 is the overnight low. Both are above the day's average price of 1369. If we stay above that 1372 mark on early selling, I'd expect a run at the highs. A move below 1371.25 would represent fresh selling and would initially target that 1369 price. A large part of my AM preparation is constructing what if scenarios, waiting for buyers and sellers to take their turns in early trade after the open, and then go with the scenario that best fits my research. That research has me leaning to the sell side on buying that dries up and that cannot make new highs, but I can't be too much of a bear if selling cannot push us below yesterday's average price. In these situations, I tend to be cautious: I'd rather wait for things to line up and place one good trade than try to make things happen with multiple trades that have dubious edges. The need to trade is the enemy of the need for profit. Back in a bit. 7:28 AM CT - Lots of Blogger problems this AM; if you don't see regular updates after the open, you'll know why. We're in a narrow range ahead of big numbers shortly: core CPI expected at .2%. I'll post after the release and update the prep for the open. My overall framework is based on the research from the last Weblog entry: weak short-term, up after that. Keep an eye on interest rates and the dollar after the release: if they break new ground, the odds are increased that we'll do the same in stocks. Back shortly. Each day in the Trading Psychology Weblog, I track the number of stocks making new 20-day highs and 20-day lows. These give us an intermediate-term sense of whether the market is strengthening or weakening. How about the bigger picture, however? If many stocks are making 52-week highs, does it pay to buy? I went back to 1990 (4196 trading days) and computed the number of 52-week NYSE highs as a percentage of the total issues traded each day. What we find is that there were 136 occasions in which 10% or more of traded stocks made fresh 52-week highs. One such occasion occurred this past Monday. What we find is that, 40 days after we get a large number of new highs, the S&P 500 Index ($SPX) is up on average by only .32% (68 up, 68 down). That is a subnormal return when compared to the average 40-day return of 1.47% (2695 up, 1501 down) over that period. In other words, buying stocks when lots of stocks are high has not been a good buy. When only .5% or fewer of stocks are making new highs (N = 202), the next 40 days in $SPX average a sizable gain of 4.34% (164 up, 38 down), much better than average. When very few stocks are making new highs, it's been worth a buy. It is only human nature to become more bullish as more stocks are making fresh highs. But if human nature were rewarded in the marketplace, we'd see more trading millionaires. Investing is the most difficult of sports: nowhere else does one begin a career by opposing the world’s most accomplished professionals. Respect is the first casualty in lost love. Four industries dominate the economy: hope, escape, protection, and convenience. Success is the point at which talent and skill meet opportunity. The aim of all trading education: to encourage trading. The printing press democratized the acquisition of knowledge; the computer has democratized its dissemination. Date markets before deciding to marry them. Anatomy of a bad trade: Hope, then despair. 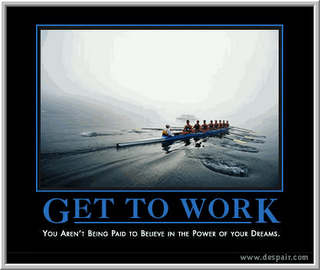 Work without talent is drudgery; talent without work is self-betrayal. Good traders master a market; great traders master markets. Trading is the only sport in which the rules governing the players change constantly—and without notice. The essential message of Web 2.0: Knowledge resides in minds, not just mind. The absence of self-acceptance too often masquerades as the quest for self-improvement. Fidelity to purpose: the mark of good investments and great investors. Talent is the better part of trading psychology. The foolhardy trade is the courageous trade held a few minutes longer. In all fields, performance belongs not just to the talented, but to the prepared. Self esteem is treating ourselves with justice, not kindness. Addiction: when the desire to trade exceeds the desire to make money. All traders pay attention to price change, but should they also be looking at the patterning of that change? Does *how* a market moves from one point to another make a difference in its future movement? In my recent post, I looked at strong 60-day periods in the market and showed how it is not just the trend of price change, but its trajectory, that leads for those moves to persist. This post will focus on short-term moves of five days going back to 2004 (N = 697 trading days). During that time, we've had 258 occasions in which the S&P 500 Index (SPY) has been up over the last five sessions and up over the most recent session. Three days later, SPY has averaged a loss of -.03% (130 up, 128 down). That is weaker than the average gain of .09% (387 up, 310 down) for the entire sample. When the previous five sessions have been up, but the most recent trading day has been down (N = 133), the next three days in SPY average a gain of .04% (74 up, 59 down)--a bit weaker than average, but not so weak as the dual up periods. When the previous five sessions in SPY have been down, but the latest day has been up (N = 119), the next three days in SPY have averaged a gain of .15% (68 up, 51 down), somewhat better than average. When the last five sessions are down *and* the most recent trading day is down (N = 187), the next three days in SPY average a gain of .25% (115 up, 72 down), handsomely above average. These data fit nicely with the findings of Larry Connors and Conor Sen in their book "How Markets Really Work", which found that returns are better after short-term weakness rather than short-term strength. The results also suggest that market returns are patterned in a manner that is precisely the opposite from the pattern of human expectations. If we see something rise during the past day and also during the past five days, it is human nature to look for the trend to be our friend and continue into the next several days. Conversely, if the market is down today and has been down over the past week, we naturally consider the market weak and expect further price softness. But what happens is precisely the opposite. The psychology of short-term trading begins with the simple realization that the market's patterns run counter to the cognitive and emotional patterns of the average person. Which may be why average people do not profit as short-term traders. In a recent post, I showed how markets that have been extended to the upside aren't necessarily "overbought" and ripe for decline. Strong momentum rises have better odds of persisting over the next time frame than rises with weak momentum. Here, we'll take a different look at the data. Going back to 1990, we're examining periods of time that, like the present, are up solidly over the past 60 days (between 7.5% and 11.5%; N = 490) in the S&P 500 Index ($SPX). When we've been so strong over a several month period, are we due for decline, or are we in an uptrend that's likely to persist? To examine this question, I broke down the strong 60-day periods into two groups. The first group was also strong on a 20-day basis (like the current market), rising more than 3% over that time (N = 218). The second group was weaker on a 20-day basis, rising less than 3% (N = 272). Thirty days later, $SPX was up by an average of 2.30% for the strong 20-day group (163 up, 55 down). That is considerably stronger than the average 30-day gain of 1.08% for the entire sample. Conversely, when we were up solidly over 60 days, but relatively weak over the most recent 20 days, the next 30 days in $SPX averaged a gain of only .97% (163 up, 109 down)--no edge whatsoever with respect to the entire sample. What that suggests is that it isn't just a market's rise that leads to favorable price expectations, but the trajectory of that rise. This fits with the findings regarding momentum persistence. When we've had a strong 60-day period *and* the most recent trading day is a 60-day high (as is the case at present; N = 169), the next 30 days in $SPX have averaged an impressive gain of 2.31% (127 up, 42 down). When the most recent day hasn't been a 60-day high, the next 30 days in $SPX have averaged a gain of 1.17% (199 up, 122 down). 1) Just because we've been up strongly over a several month period doesn't mean we're ripe for decline. Overall, following a strong 60-day rise, the market has gained an better-than-average 1.56% over the next 30 days (326 up, 164 down). 2) The journey is as important as the destination. Given a strong 60-day rise, we see better returns on average when the most recent price action is strong. This is one reason I include many measures of recent market strength in the Trading Psychology Weblog. Can the market tank after a strong 60-day high? Absolutely. It occurred in July, 1990; February, 1997; January, 2002; and April, 1999. Is it the norm? Not at all. When we've made a 60-day high in a strong market, the next 30 days have shown positive returns 75% of the time. If you have a valid trading methodology, the role of psychology is to aid your executing it more consistently and effectively. One of the most important points I made in the Psychology of Trading book is that trading performance is not so much a matter of controlling emotions as controlling your focus and concentration. If you treat your emotional responses as market data--information, not problems to be covered over--you'll find that focusing on your experience (not getting lost in it) can pay off handsomely. Let's take an example. The market has bounced off a price level a couple of times, and you're noticing reduced volume as we test those lows. The third time we approach the lows, you decide to buy the market. We bounce higher, stall, and then a large local begins to put large offers in the book, capping the buying. Within seconds, locals (perhaps that very same local) pulls bids and the market whooshes lower, breaking the recent support by a couple of ticks. Your trade is under water. Does a trader feel fear or frustration at those moments? Of course. The question is not whether you have those emotions, but whether or not you lose your focus and blindly act upon them. 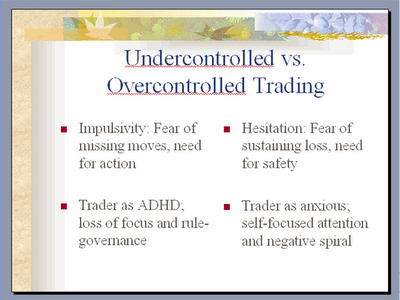 As the slide above notes, to lose your focus is to become undercontrolled--impulsively putting on "revenge" trades--or to become overcontrolled, frozen with fear like a deer in the headlights. A better alternative is to become an observer to those emotions. Perhaps, if you are becoming concerned about your position, other traders are as well. That prods you to increase your focus: look harder at what's going on in the market. When you notice that there are very large bids just below the market, you realize that large players are pushing the market into those bids. Your fear and frustration are what will make you hit their bids and get them out of their positions. Volume, after all, has not expanded on the move down: the running of stops was the result of a vacuum caused by strategies played out in the order book. Within moments, the market is back trading where you bought it. There are good reasons to stay in a trade, and there are good reasons to exit and stop yourself out. The question is whether your decision is the result of enhanced focus--using your emotions as warning signals that alert you to important market changes--or the result of attention that has been shifted toward your P/L fears and frustrations. As any competitive athlete or soldier knows, emotion can be your friend or foe: it can make you focus harder on your circumstances, or it can distract your focus. It's much easier to maintain your focus when you have a well thought-out trade idea to focus upon. Much loss of focus (and resulting emotionality), I find, is simply the result of trades that lack a firm grounding. Free psych resources for traders are available on my personal site. Trading, at its best, develops us as it develops our skills.